The Eucharist is the summit and source of our life as Catholic Christians. When we come together we form church. 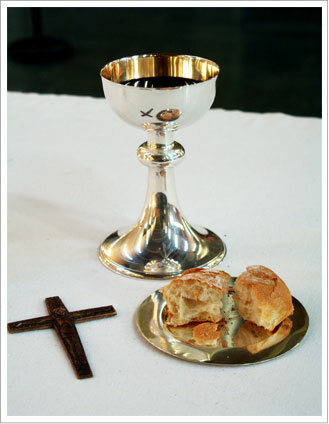 We celebrate the liturgy that allows us to hear God's Word and receive the Body and Blood of Jesus in the Eucharist. Eucharistic Ministers are men and women who are called to this ministry after prayer and reflection. Eucharistic Ministers should be person who have developed a good prayer life and who regulary attend the weekly liturgy. It is a privilege to be called to be a minister of the Eucharist and to nourish our brothers and sisters in the community with the Body and Blood of Jesus. Eucharistic Ministers may also be asked, on occasion, to take the Eucharist to individuals unable to leave home and come to Mass. Any man or woman who has received Sacrament of Confirmation and feels so called to be part of this ministry should contact the parish office.